Three years ago, Sophie Mercer discovered that she is a witch. Her non-gifted mother has been supportive, consulting Sophie’s estranged father—a warlock—only when necessary. 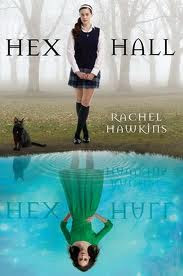 But when Sophie attracts too much human attention for a prom-night spell gone horribly wrong, it’s her dad who exiles her to “Hex Hall”, an isolated reform school for wayward Prodigium, a.k.a. witches, fairies, and shape-shifters. By the end of her first day, Sophie has three new enemies, a futile crush on a warlock, a tagalong ghost, and a vampire roommate. Worse, Sophie soon learns that an unknown predator has been attacking students. As a series of blood-curdling mysteries converges, Sophie prepares for the biggest threat of all: an ancient secret society determined to destroy all Prodigium, especially her. Kind of a Harry Potter meets Twilight... add in the House of Night series... stir it all around. Yep. That sounds about right. I did enjoy the story. I did move on immediately to read Book 2. I was disappointed to find out that Book 3 isn't out yet.